Our Shorkies are a cross between an APRI Shih Tzu and an APRI Yorkshire Terrier. Shorkies are hypo-allergenic and non-shedding. 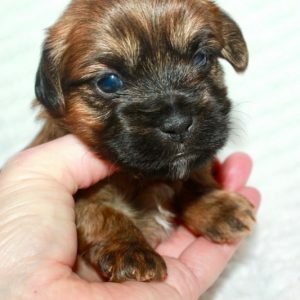 Our Shorkies will weigh 6-9 lbs when they are mature. They are great with children and are easy to train. Shorkies make excellent companions and are the perfect addition to any family. 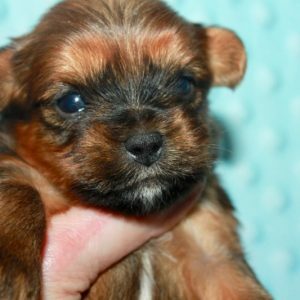 They are a small furry package all wrapped up in a ton of puppy : ) You will find your Shorkie to be huggable, lovable and sweet! Claire is an precious little Shorkie! Her parents are Mylie and Boomer, our registered Shih Tzu and Yorkie. I expect Claire to weigh 6-8 lbs whens she is full grown. She will be ready to go around May 15, she can be reserved now. Cheerio is an awesome little Shorkie! 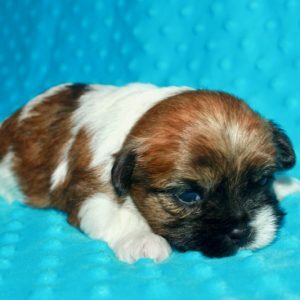 His parents are Mylie and Boomer, our registered Shih Tzu and Yorkie. I expect Cheerio to weigh 7-8 lbs when he is full grown. He will be ready to go around May 15, he can be reserved now. Cassidy is an awesome little Shorkie! 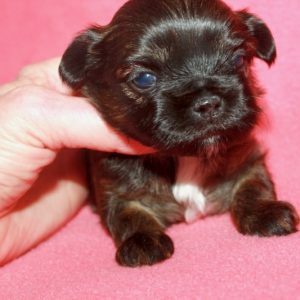 His parents are Mylie and Boomer, our registered Shih Tzu and Yorkie. I expect Cassidy to weigh 7-8 lbs when he is full grown. He will be ready to go around May 15, he can be reserved now. Carter is a sweet little Shorkie! His parents are Mylie and Boomer, our registered Shih Tzu and Yorkie. I expect Carter to weigh 7-8 lbs when he is full grown. He will be ready to go around May 15, he can be reserved now.